Stories are an integral part of our experience as human beings. As Roland Barthes put forward, narrative “is present at all times, in all places, in all societies; indeed narrative starts with the very history of mankind; there is not, there has never been anywhere, any people without narratives; all classes, all human groups have their stories….” Narrative theories (in literature, media studies, psychology, or neurology) have explored the impacts of narratives on our ways of being, thinking, dreaming, and remembering. This article will explore the implications of narrative theories for learning in a contemporary art museum context. The different discourses of the museum, the way narratives are constructed in museum spaces, and how museum spaces can be considered syntactical have been explored by scholars such as Mieke Bal, Bruce W. Ferguson, and Tony Bennett. This article proposes to build on this existing literature as well as other areas of narrative theory to investigate beyond the discursive system of the museum display and its narrative qualities, in order to focus on the impact of these narratives on learning processes. The art museum, and the contemporary art museum in particular, implies a certain frame for the visitor and a certain set of expectations: an openness of interpretation, a type of experience, a kind of authorial voice, etc. As Ferguson argues, in art exhibitions “the idea that meanings are impossibly unstable is embraceable because inevitable. With works of art, meanings are only produced in context and that is a collective, negotiated, debated and shifting consensual process of determination. Representation is always in crisis, which is always a form of freedom.” This instability of meaning is precisely what makes art museums a particularly interesting object for studying the impact of diverse narrative forms on learning in museums. Learning in museums has been defined in many ways, but for the purpose of this article we will define museum learning as learning that is lifelong, free-choice, and multiform. Learning in the museum is a combination of learning cognitive information, learning affective information, and learning psychomotor information. 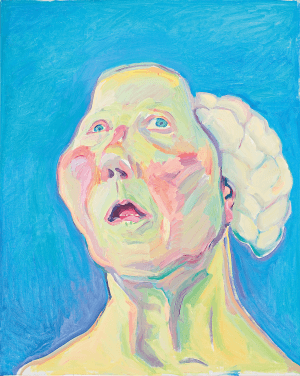 This article focuses on this specific definition of learning, as it is particularly suitable for art museums where bodies and emotions are highly engaged in the learning process. One important aspect of learning in contemporary art exhibitions is the perceived tension between immersive and discursive exhibition designs. While immersive and discursive modes of exhibiting are not opposed to each other, the impacts on visitors and the kinds of learning processes and knowledge these models create are very different. In discursive models, the knowledge created is often in the realm of cognitive information. Discursive exhibition spaces are designed as spaces “that foster negotiation and debate, polarize and politicize space, and invite discussion fraught with contradictory views.” Andrea Witcomb describes these kinds of designs as a “polysemic exhibition practice” where multiple voices are curated together into a narrative. On the other hand, immersive exhibition designs aim to create knowledge in the realm of experience and affective information, and they look “to mobilise the visitor’s sensations and imagination by integrating them into universes that encourage the reception of the exhibition’s messages.” Jean Davallon emphasizes that immersive models tend to focus on authenticity and truth rather than polysemic debates. If we look back to Mieke Bal’s famous description of the museum discursive act as, “look! – that’s how it is!,” or more recently, with the implementation of more open forms of museum discourses, “is it how it is?,” the contemporary art immersive exhibition takes a different discursive position exhorting the visitor to feel rather than solely look. Indeed, in the immersive model, the art exhibited is not a “mute” or “third person,” but a firsthand experience/voice for the visitor. The power of the museum as expository agent is therefore theoretically diminished by the unmediated impact of the artwork on the visitor. This article will focus on learning in these two environments and explore what kind of learning takes place in immersive and discursive exhibitions in art museums. It will do so investigating how narrative theory can contribute to our understanding of learning processes. If we accept Jerome Bruner’s position that narratives define human identities and reality, then immersive experiences in museums change who we are as visitors. The immersive experience of the museum visit enters the visitor’s narrative. But this experience will most likely enter the visitor’s narrative without giving the visitor an opportunity for critical thinking or analytical engagement with the material the museum presents. What kind of learning takes place, then? Do immersive exhibitions offer the ideal environment for transformative learning, emotional learning, and/or experiential learning? On the other hand, if the approach of the museum exhibition is discursive, the experience of the museum enters the visitor’s narrative in parallel to the visitor’s own, as a story that can be critically assessed, as a discourse that can be analyzed. 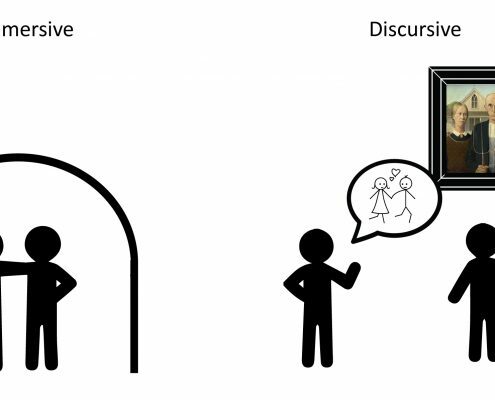 The discursive creates a space for reflection but diminishes the emotional engagement. What kind of learning takes place here? Is it still experiential learning? Do discursive exhibitions offer the ideal environment for other types of learning? We will first explore how narrative theory can help us better understand the museum public and its relationship to immersive and discursive environments. We will then explore the impact this has on learning by looking at a few specific learning theories particularly relevant to contemporary art museums: emotions in learning theories (especially Robert Zajonc and Richard Lazarus), Jack Mezirow’s transformative learning, David Kolb’s experiential learning, Peter Jarvis’s learning from primary experience, and Étienne Wenger’s social theory of learning. Through this theoretical exploration, we hope that the implications of some core aspects of narrative theories on learning in a museum context will emerge and give new perspectives that can further be explored in the field. Museums have long used narratives as a way to communicate with their public. Art exhibitions are, as Ferguson emphasizes, “narratives which use art objects as elements in institutionalized stories that are promoted to an audience.” Tiina Roppola further stresses that “story, or narrative, is the vehicle of choice for channeling the content of the museum, with its absence disconcerting to visitors.” If we look at the different “acts” of the history of exhibition design described by Roppola, we can see that narratives, while used in a range of ways, are a constant presence in museum mediation strategies. In “Act 1: staging curiosity,” the exhibition displays authority of knowledge and creates a miniature representation of the world for the visitor. Here, the museum presents its narrative as an omniscient narrator would: all-knowing, yet with an individual viewpoint. The story is then passed on to the visitor through display and signage. In “Act 2: a new museum order,” the intent of the museum is one of universal knowledge and organization: “to arrange objects in developmental, historicized sequences, culminating in the present.” Roppola argues that such exhibition designs carry specific ideologies and played a role in nation-making exercises. There again, the narrative of the museum is an authoritative one. The order of the display as well as the accompanying signage creates a sort of biography of objects, artists, nations, and histories by projecting a narrative that appears impartial and detached. In “Act 3: the world transported,” Roppola describes the development of period rooms and dioramas that transport the visitor to different times and places, and “exert covert power through a sense of authenticity.” These immersive designs, while giving the visitor the illusion of unmediated experience, reinforce the museum’s narrative by staging that narrative in space. In “Act 4: a participatory repertoire,” Roppola describes the development of hands-on, participatory, and visitor-centered museums. Based on discovery learning, these models are at first sight less narrative-based. However, it is important to note that, while the creation of the narrative through those displays is left open to interpretation, the visitor is still expected to come to the “right” conclusions. In “Act 5: (de) constructing inclusion,” Roppola presents the museum’s goal as inclusivity. Its role in regards to narratives then shifts: the museum must collect and include new, other, and underrepresented narratives, and use the visitor’s prior knowledge and existing individual narrative to communicate it better. The museum is then in the position of a narrative collector, analyst, and presenter. In “Act 6: spurring the experiential,” Roppola describes how experience has become an entry point for the visitor. The museum functions then as a theater catalyzing visitors’ experiences. This focus on visitor experience shifts the placement of the narrative from signage and space into the visitor’s body. These embodied narratives offer a difficult situation for interpretation: are we still after some “right” conclusions, or is the individual visitor’s experience really all that matters? In “Act 7: the (networked) world enters stage left,” new mobile technology developments, social media, and crowdsourcing are considered. There again, the narrative seems freed from the authoritative authorial voice of the museum and is instead centered on the visitor’s narrative, but one must wonder to what degree this is true in practice. We see in the different “acts” the impact of new museology on the narrative of exhibitions in general, and that of art museums in particular. As Bal highlights, “If there is anything that would differentiate the ‘new’ museology from the ‘old,’ or plain museology, it is the serious follow-up on the idea that a museum installation is a discourse, and an exhibition is an utterance within that discourse.” While new museology was not particularly focused on art museums, it is precisely the open nature of the meanings constructed in the context of contemporary art exhibitions that allows for a more flexible type of narrative. As we have seen, museums use and have used narratives in many different ways; narratives are a core museum mediation tool. But why do narratives work as a mediation strategy for museums? Narratives have a special effect on human beings. Narrative theory, a broad and varied field of study, has been exploring these impacts for decades. We will focus here on specific elements that span several fields of study: literature, media studies, psychology, and neurology. Our approach to narrative theory is therefore interdisciplinary and, to some measure, a constructivist approach. The first overarching element that we find in most theories is that human beings think in narratives and through narratives by using and understanding specific patterns, structures, motifs, etc. Therefore we, as museum visitors, just as readers, expect certain structures. What those structures are depend on the genre or type of narrative we identify, and this impacts the way in which we relate to the narrative. For example, according to Aristotle, a narrative is expected to have a beginning, a middle, and an end. This means that the receptor of the narrative then expects an exposition, a development, a complication, a climax, and a final resolution. We find this type of narrative used in historical exhibitions, for example, that present a specific historical event in a diachronic manner. Similarly, exhibitions adopting specific literary genres (that of the fairy tale, for example) adopt the form and codes of the genre. Vladimir Propp’s seminal study of folktales revealed that the form of a tale could remain unchanged but that its content could change. We see this clearly in fairy tale exhibitions that adapt and play with the narrative codes of fairy tales. What we see here is that there is no specific form for the museum narrative structure that visitors can expect, but rather that the museum narrative adopts forms from other genres and sources. It is these patterns and structures of the narrative that help human beings to understand. The second, overarching element of narrative theory (coming more from neurological science and psychology studies) is that human beings remember in narratives. Kay Young and Jeffrey Saver, based on Roger Schank, demonstrate that the making of memory is reliant on storytelling: telling the story creates the memory structure that allows us to retrieve memories. Furthermore, they state that “each act of recall is a re-creation” of the narrative rather than the retrieval of an existing “original” story. Horace Porter Abbott further argues that “memory itself is dependent on the capacity for narrative,” and that “we do not have any mental record of who we are until narrative is present as a kind of armature, giving shape to that record.” This means that narratives are key to the process of memorizing and retrieving or retelling knowledge. This has, of course, an impact on the way museums function, and is particularly important for the educative/learning role of the museum. John Falk and Lynn Dierking highlight that “universally, people mentally organize information effectively if it is recounted to them in a story or narrative form.” Furthermore, if we agree with Falk that “just as there is no single right way to learn things and there is no single place or even moment in which learning occurs,” then the place of narrative in the museum is central. If we consider that knowledge is initiated in the museum, the narrative proposed by the museum or created in the museum must later be easily reconstructed and re-narrated by the visitor at every memory retrieval event. If we consider museum experience as reinforcement rather than challenging existing knowledge, then the museum must evoke and stimulate links with other narratives, thereby creating the narrative “armature” that will anchor the memorization process. In any case, the museum is a key link in the chain of learning through narrative, and in the process of memorization. The final, overarching element, and a consequence of the two previous elements, is that narratives construct our identity (or identities) as well as our reality. According to Oliver Sacks and other neurologists, narratives define human identities. Paul John Eakin goes a step further, stating that we create our identity through self-narration. Young and Saver reinforce this argument; to them, memory, self, and narratives are intrinsically linked. Bruner argues that “we seem to have no other way of describing ‘lived time’ save in the form of a narrative.” To him, criteria for self-narration exist but they are unstable, which “makes life stories highly susceptible to cultural, interpersonal, and linguistic influences.” For Bruner, it is our whole reality that is built on narratives. In “The Narrative Construction of Reality,” Bruner reasserts that we understand reality through narratives, but also that we construct reality using narrative. This has particular significance for the way we consider immersive and discursive exhibitions and their impact on visitors. These three overarching elements—that we think in and through narrative, that we remember in narrative, and that narratives are central to the construction of our reality and identity—have consequences when we look at the impact of exhibitions on museum visitors. Whether consciously or unconsciously, exhibitions materially express a discursive stance. That is, they express “reality” from a particular perspective and have particular interests at their core. This puts into question constructivist approaches to exhibition design. Exhibitions where the visitor is invited to circulate freely do not mean that no narrative will be constructed on the part of the visitor between the different parts of the exhibition. Regardless of whether it is there in the first place, visitors always reconstruct some kind of narrative which will impact the meaning-making process. In his work on artificial intelligence, Schank states that “storytelling and understanding are functionally the same thing.” This link between narrative, meaning-making, and understanding implies that plot patterns and motifs impact the perception of the exhibition, the process of meaning-making, understanding, and remembering, which are all key steps in the learning process. Stories can openly declare themselves as stories, or they can be hidden. When we choose to be in the company of a story by reading a novel or seeing a film, the narrative sets itself off as a narrative, not as a part of our lives; we stand in relation to it as audience to its “performance” as an aesthetic work. However, the storytelling we experience as an event in life can lose its appearance as narrative by virtue of its integration in life. This confirms our assumption, based on Bruner, that an immersive experience in a museum visit enters the visitor’s autobiographical narrative. A visit to an immersive installation becomes something that has happened to the visitor as an individual: it has entered the visitor’s own self-narrative. This experience will be integrated in the visitor’s own history, and this integration in the autobiographical narrative will not give the visitor an opportunity for critical distance or analytical engagement with/of the experience of the immersive display. The impact of the visit is on an affective rather than a cognitive level. We can even go so far as stating that an immersive art exhibition creates a more than a “performance” narrative but a fiction, that Bal defines as “an account of made-up events, asking for the reader’s [or in this case visitor’s] ‘willing suspension of belief,’” while the discursive experience presents a narrative, “an account […], made up or not, presented from a particular perspective and suggesting that the reader [or visitor] endorse [or not] that perspective.” In discursive exhibitions, the narratives the museum presents are experienced concurrently with the visitor’s own narrative, as a story that can be critically assessed, as a discourse that can be analyzed. The discursive display creates a space for reflection but diminishes the affective engagement of the visitor, as the narratives are not part of his/her autobiographical narrative. The visitor experiences discursive experience as an external narrative on which he/she can have a critical view or look for existing patterns. Fig 1. Immersive design experienced as part of the visitor’s autobiographical narrative and discursive design experienced as a narrative parallel to the visitor’s own narrative. We have established that narratives are a communication strategy extensively used by museums. We have shown that narrative theory tells us that narratives have an impact on the way humans think, remember, and perceive themselves and the world. Based on narrative theory, we concluded that visitors in museums always reconstruct a narrative, and that this narrative is essential in the meaning-making, understanding, and remembering process of the museum material (that is in every step of the learning process). 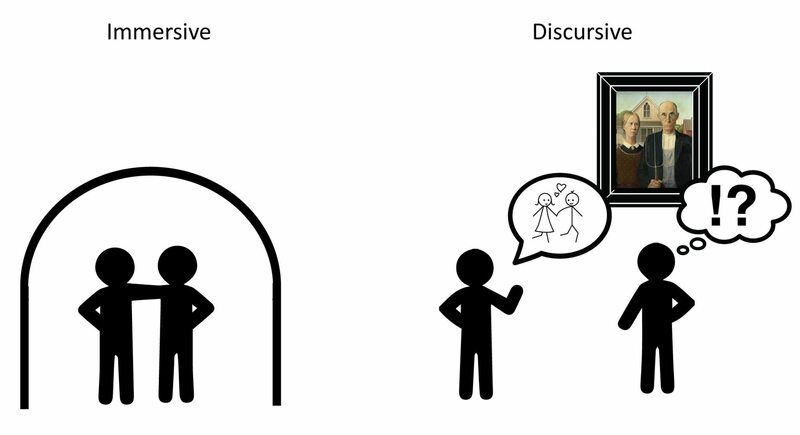 Based on narrative theory, we also concluded that immersive and discursive exhibition models have a very different impact on the visitor’s narrative perception and creation. What are the consequences of these findings on learning in museums? In the second part of this article, we will explore the consequences of our findings on different learning theories. These learning theories have been chosen because of their relevance to the art museum field, and also because they tend to be used by museum professionals in designing exhibitions, as well as interpretation or education programs. There are two ways of considering emotions in learning. First, as does Robert Zajonc, we can consider emotions and feelings as a direct, unmediated response to the world or the artwork that then has cognitive consequences. One of the strengths of immersive exhibitions, as we have seen, is the strong emotional connection created by the integration of the experience in the visitor’s autobiographical narrative. Immersive exhibitions are constructed on “an approach based on emotion as the trigger to the desire to know and on sensations.” But, as Florence Belaën also highlights, immersive models only work if the visitor knows (consciously or unconsciously) the codes that are being used, that is, if the narrative remains undisclosed. The immersive exhibition can therefore be an efficient model to trigger emotions that promote and engage the visitor with cognitive learning. In theory, the immersive model, from the viewpoint of Zajonc on emotions in learning, has the potential to achieve both the learning of affective and cognitive information. The second way to look at emotions in learning follows Richard Lazarus, who argues that emotion requires prior cognitive interference that we need knowledge to feel and relate. In that case, the discursive exhibition model should be ideal to create this kind of emotional engagement. As the narrative parallels the autobiographical narrative of the visitor, the discourse of the exhibition can be examined cognitively and trigger an emotion. In any case, emotional (re)action is key in the process of meaning-making, and therefore learning. The exhibition, whether it enters the visitor’s narrative or is perceived as a parallel narrative, has an emotional impact. Both immersive and discursive models, through emotion, contribute to the building of knowledge, identity, and the reality of visitors. While transformative learning was devised in the 1970s to help the reintegration of adult women, this theory is gaining new interest from the museum field, as social integration is becoming a more prominent mission of cultural institutions. Indeed, this theory conforms to ideals of a museum promoting lifelong, free-choice, and multiform learning. The essential characteristics of transformative learning are critical reflection (or critical self-reflection) on assumptions and the creation of a critical discourse that allows the learner to confirm a best judgment. If we look at Jack Mezirow’s transformative learning sequence considering the changes in narrative position in immersive and discursive exhibitions, unexpected results appear. Transformative learning, being based on critical reflection and assumptions (frames of mind), seems more suited to the discursive model’s narrative impact. The reflective distance present in the parallel narrative created in the discursive exhibition seems ideal for stages such as the critical assessment of assumptions (Phase 3) or the recognition that others have gone through similar challenges (Phase 4). However, when we look closer at the immersive model and its impact on narrative perception of the visitors and identity construction, it actually has the potential to facilitate/enable some phases of transformative learning, such as the creation of a disorienting dilemma (Phase 1), creating space/time for self-examination (Phase 2), allowing for the exploration of options for new roles (Phase 5), providing space/time for the provisional trying of new roles, and the building of competence and self-confidence (Phases 8 and 9). So while instinctively the discursive model would seem to be the best fit for transformative learning to take place, when looking at the narrative impacts of the models on the visitors it becomes clear that immersive exhibitions are as beneficial to the transformative learning process. For transformative learning, immersive and discursive models are, in theory, complementary. David Kolb’s theory has been increasingly popular in museum interpretation and education programs (especially in the Netherlands). His theory takes as a starting point that there are different types of learners that have certain preferences in terms of learning style: accommodators (who prefer doing and feeling), divergers (who prefer feeling and watching), assimilators (who prefer watching and thinking), and convergers (who prefer thinking and doing). However, Kolb argues that, despite those preferences, several stages should be covered for the learning cycle to be complete: active experimentation (doing), concrete experience (feeling), reflective observation (watching), and abstract conceptualization (thinking). 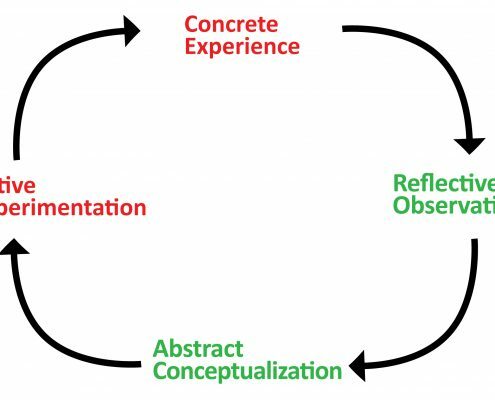 If we look at Kolb’s cycle of experiential learning and consider the changes in narrative posture from immersive to discursive, we see that the two models cover different parts of the learning cycle. Fig 2. 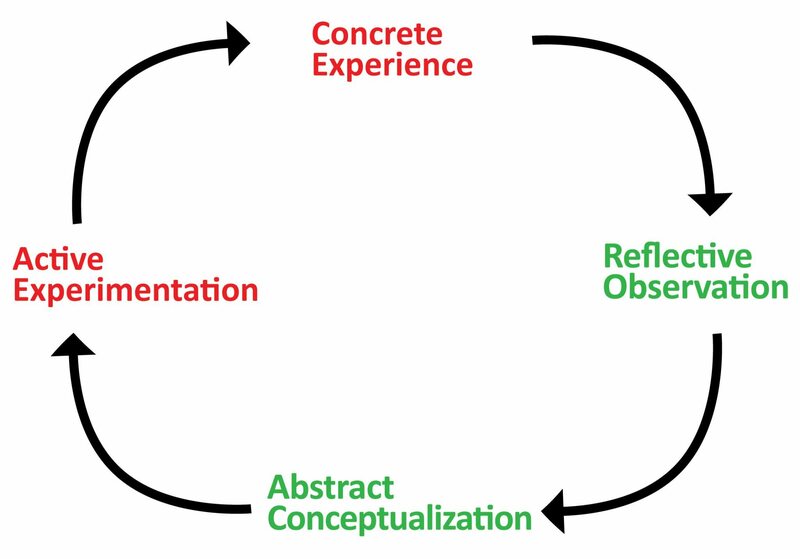 Kolb’s experiential learning cycle applied to immersive (red) and discursive (green) exhibition designs. The immersive exhibition design, being anchored in the body of the visitor and integrated in the visitor’s narrative, allows for a more hands-on experience. The immersive model of exhibition covers active experimentation and concrete experience. The discursive exhibition design, because it offers a narrative distance, will be useful in the reflective observation phase. This narrative distance will also allow for a generalization of the experience, leading to the abstract conceptualization phase. According to Kolb, this cycle needs to be complete for learning to take place. Therefore, in that particular learning system, immersive and discursive are complementary. For Peter Jarvis, “all human learning begins with disjuncture—with either an overt question or with a sense of unknowing.” For him, the social and the interaction are key to learning, as learning is both existential and experiential. 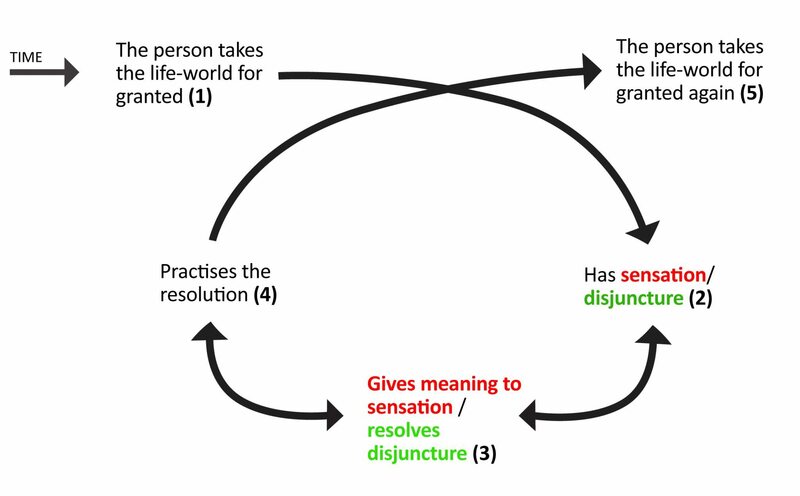 In Jarvis’s learning from primary experience model, sensation or disjunction are the motor that enables learning. Fig 3. Jarvis’s learning from primary experience model applied to immersive (red) and discursive (green) exhibition designs. 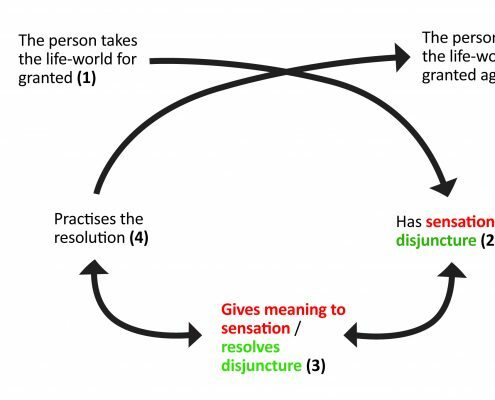 In this model, both sensation and disjunction are given equal status as potential triggers to learning. Sensation will be the trigger in immersive models while disjunction (a challenging idea, for example) will be the trigger in discursive models. However, to Jarvis, visitors cannot make meaning alone: they need a social interaction to be enabled as a learner. Therefore the exhibition, whichever model it relies on, must provide for a social context that encourages interaction. Immersive or discursive models are not inherently more or less able to create that social context, but it does need to be planned for in the exhibition design. It is also interesting to consider here the role of others (listeners/receptors) in the production of narrative. A narrative (and therefore also a visitor’s narrative) is often produced for others and exists within a broader social and cultural discourse. There should, therefore, be a willingness among visitors to share stories gathered from the exhibition or autobiographic constructions with some peer group. Recent developments in participatory practices have tried to harness this narrative potential and potential social interaction to improve the quality of learning in museums. We established that there is a significant difference between immersive and discursive exhibitions in the way the narrative impacts on and is created by visitors. We also established that immersive and discursive modes of exhibition seem rather equivalent or complementary in the way they promote learning, and we can already quite confidently say that a hybrid exhibition environment with some immersive parts and discursive parts seems to be an ideal museum learning environment. This brings us to the challenges of art museums: modern and contemporary artworks are often intrinsically already immersive or discursive before they enter the museum. To achieve an optimum visitor learning experience, it is then the role of the museum to create environments and support material that allow visitors to move between the discursive and the immersive. Paul Ricœur, in “Life in Quest of Narrative,” argues that a narrative is the synthesis of heterogeneous elements and the making of a single story out of multiple distinct, and sometimes conflicting components. This describes rather accurately the work art museums must do to weave together different discourses and interpretations, as well as immersive and discursive experiences. Narrative theory, we believe, is an interesting and underused interdisciplinary tool for looking at museums, and learning in museums in particular. We imagine that using narrative theory as a framework to conduct visitor’s research on his/her perception, construction, and retrieval of narratives would be very fruitful, helping museums to gain a better understanding of the kind of learning and learning processes that happen in museum environments, as well as explore new perspectives on learning and meaning-making. Dr. Emilie Sitzia is Associate Professor in the Department of Literature and Art at Maastricht University. She teaches cultural education, curatorship and interdisciplinary research methods in the Master of Arts and Heritage program, as well as 19th and 20th century art and literature in the BA Arts and Culture program. She recently published a book, Art in Literature, Literature in Art in 19th Century France (2012), and publishes regularly on art, literature and museumstudies topics. Roland Barthes, “An Introduction to the Structural Analysis of Narrative,” New Literary History 6, no. 2 (1975): 237. See, for example, Mieke Bal, Double Exposures: The subject of cultural analysis (New York: Routledge, 1996), or Reesa Greenberg, Bruce W. Ferguson, and Sandy Nairne, eds., Thinking about Exhibitions (London/New York: Routledge, 1996). Bal, Double Exposures, 88. Bal identifies diverse acts of expositions, such as “showing and showing off, pointing out and pointing at, praising and trashing and taking for granted, explaining and persuading.” All these modes of narration imply a strong authorial and authoritative voice on the part of the curator/institution. This has, I believe, evolved since 1996, and the focus is now generally on participatory practices, open interpretations and co-creation opportunities. Ferguson, et al., Thinking About Exhibitions, 186. See, for example, George Hein, Learning in the Museum (London/New York: Routledge, 1998), or Eilean Hooper Greenhill, Museum and Education: Purpose, Pedagogy, Performance (London/New York: Routledge, 2007), or Caroline Lang, John Reeve, and Vicky Woollard, The Responsive Museum: Working with Audiences in the twenty-first century (Aldershot, England, and Burlington, VT: Ashgate, 2006). We ground the article in Falk and Dierking’s theories. See, for example, John Falk, “Director’s Cut: Towards an Improved Understanding of Learning in Museums,” Science Education 88 (2004): 83–96; see also John Falk, Lynn Dierking, and Marianna Adams, “Living in a Learning Society: Museums and Free-Choice-Learning,” in A Companion to Museum Studies, ed. Sharon McDonald (Oxford: Blackwell Publishing, 2008), 323–339. John Falk and Lynn Dierking, The Museum Experience (Washington, DC: Whalesback Books, 1992). Jana Macalik, John Fraser, and Kelly Mckinley, “Discursive Space,” Curator the Museum Journal 58 (2015): 1. Andrea Witcom, Re-Imagining the Museum: Beyond the Mausoleum (London: Routledge, 2003), 89–90. “Elles cherchent à mobiliser les sensations et des visiteurs en les integrant dans des univers propices à la reception des messages du contenu de l’exposition.” Florence Belaën, “Les expositions d’immersion,” Lettre de l’OCIM 86 (2003): 27 (all translations in this article are by the author). Jean Davallon, L’exposition à l’œuvre: strategies de communication et médiation symbolique (Paris: L’Harmattan, 1999). Bruner, “The Narrative Construction of Reality,” Critical inquiry 18, no. 1 (1991): 1–21. This article focuses on learning in the museum. It takes a limited number of educational theories as its starting point to explore the impact of immersive and discursive exhibition environment on learning. It is therefore limited in its scope and potential results, and should be followed by an extended field research to validate any theoretical findings. Ferguson, et al., Thinking About Exhibitions, 175. Tiina Roppola, Designing for the Museum Visitor Experience (New York: Routledge, 2012), 5. Peter J. Rabinowitz, Brian Richardson, and Robyn Warhol, Narrative Theory: Core Concepts and Critical Debates (Columbus: Ohio State University Press, 2012). Vladimir Propp, Morphology of the Folktale (Austin: University of Texas Press, 1968). See Emilie Sitzia, “Beyond the Book in the Glass Coffin. Musealization of Fairy Tales: from Theme Parks to Museums?,” Interférences littéraires/Literaire interferenties 16 (2015), 125–138. Other narrative models, such as Lévi-Strauss’s binary opposites (narrative is conflict between these opposites), Campbell’s archetypes and quest, or Vogler’s hero’s journey in Hollywood, could be considered as narrative frameworks to analyze exhibition models. Kay Young and Jeffrey Saver, “The Neurology of Narrative,” SubStance 30 (2001): 72–84. Abbott, The Cambridge Introduction to Narrative, 2–3. John Falk and Lynn Dierking, Learning from Museums: Visitor Experiences and the Making of Meaning (Lanham, MD: Altamira Press, 2000), 51. John Falk, “The Director’s Cut: Toward an Improved Understanding of Learning from Museums,” Science Education 88 (2004): 89. Some, like Tony Bennett, would argue that the reality created by the museum is one of control, power of the institution over the individual, “knowing power and what power knows, and knowing themselves as (ideally) known by power, interiorizing its gaze as a principle of self surveillance and, hence, self-regulation.” See Tony Bennett in Greenberg, et al., Thinking about Exhibitions, 84. Oliver Sacks, “The Lost Mariner,” The Man Who Mistook His Wife for a Hat and Other Clinical Tales (New York: Summit Books, 1985), 22–41. Paul John Eakin, Living Autobiographically: How We Create Identity in Narrative (Ithaca: Cornell University Press, 2008). Young and Saver, “The Neurology of Narrative,” 74. The study further shows that an issue with narrative construction is that it “destabilizes and distorts human personality” (ibid., 77). Bruner, “Life as Narrative,” 692. Ibid., 694. “In the end, we become the autobiographical narratives by which we ‘tell about’ our lives” (ibid., 692). Bruner, “The Narrative Construction of Reality,” 3–6. To him, narrative “operates as an instrument of mind in construction of reality” (ibid., 6). Roppola, Designing for the Museum Visitor Experience, 5–6. Quoted in Young and Saver, “The Neurology of Narrative,” 73. Robert Zajonc, “Feeling and Thinking: Preferences Need No Interferences,” American Psychologist 35 (1980): 151–175; Zajonc, “On the Primacy of Affect,” American Psychologist 39 (1984): 117–123; see also Knud Illeris, ed., Contemporary Theories of Learning (New York: Routledge, 2009). “Une approche basée sur l’émotion comme élément déclencheur du désir de connaitre et sur les sensations.” Belaën, “Les expositions d’immersion,” 28. Richard Lazarus, “A Cognitivist’s Reply to Zajonc on Emotion and Cognition,” American Psychologist 36 (1981): 222–223; Lazarus, “Thoughts on the Relations Between Emotion and Cognition,” American Psychologist 37 (1982): 1019–1024; Lazarus, “On the Primacy of Cognition,” American Psychologist 39 (1984): 124–129. “The research base for the concept evolved out of a comprehensive national study of women returning to community colleges in the United States (Mezirow, 1978). The study used grounded theory methodology to conduct intensive field of study of students […] A transformative learning movement subsequently developed in North American adult education […].” Jack Mezirow, “An Overview of Transformative Learning,” in Lifelong Learning: Concepts and Contexts, eds. Peter Sutherland and Jim Crowther (New York: Routledge, 2006), 24–25. While Mezirow’s theories have evolved, we chose to use for this article the initial ten phases theory. About the evolution of Mezirow, see Andrew Kitchenham, “The Evolution of John Mezirow’s Transformative Learning Theory,” Journal of Transformative Education 6, no. 2 (2008): 104–123. Jack Mezirow, Education for Perspective Transformation: Women’s Re-Entry Programs in Community Colleges (New York: Teacher’s College, Columbia University, 1978). “Using the 4MAT System to Bring Learning Styles to Schools,” Educational Leadership (1990): 31–37; see also Susan Weil and Ian McGill, eds., Making Sense of Experiential Learning: Diversity in Theory and Practice (Buckingham: Open University Press, 1989). Others have challenged Kolb’s theory as too simple to capture the entire learning process, for example, Peter Jarvis, “Learning to be a Person in Society,” in Illeris, Contemporary Theories of Learning, 23. Jarvis, “Learning to be a Person in Society,” in Illeris, Contemporary Theories of Learning, 22. Étienne Wenger, “A Social Theory of Learning,” in Illeris, Contemporary Theories of Learning, 211. Wenger, “A Social Theory of Learning,” in Illeris, Contemporary Theories of Learning, 211. Etienne Wenger-Trayner in Omid Omidvar and Roman Kislov, “The Evolution of the Communities of Practice Approach: Toward Knowledgeability in a Landscape of Practice – An Interview With Etienne Wenger-Trayner,” Journal of Management Inquiry 23 (2014): 271. Wenger-Trayner draws an interesting distinction between information and meaning that could be most useful in a museum context. Paul Ricœur, “Life in Quest of Narrative,” in Narrative and Interpretation, ed. David Wood (London/New York: Routledge, 1991) 21–22.